At NASA's Kennedy Space Center Launch Pad 39A, STS-131 Commander Alan Poindexter, in the orange suit, prepares to enter space shuttle Discovery from the pad's White Room during the practice countdown known as the Terminal Countdown Demonstration Test, or TCDT, in 2010. NASA officials and astronauts around the world are mourning the death of retired space shuttle commander Alan Poindexter, a two-time space shuttle flier who died Sunday (July 1) in a tragic jet ski accident in Florida. Poindexter, known as "Dex" at NASA, died while vacationing with his family in Pensacola, Fla. He was jet skiing with his two sons when one of the jet skis unexpectedly hit him, according to media reports. News of the accident and Poindexter's death stunned NASA's astronaut corps. Poindexter retired from NASA's astronaut ranks in 2010 to serve as dean of students at the U.S. Navy's Naval Postgraduate School. "We in the astronaut family have lost not only a dear friend, but also a patriot of the United States," said Peggy Whitson, chief of the Astronaut Office at NASA's Johnson Space Center in Houston, in a statement. 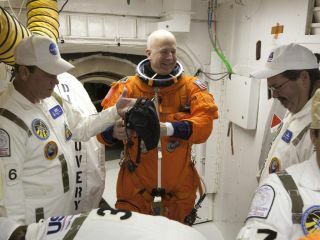 "He proudly served his country for 26 years as a fighter pilot, test pilot, astronaut and commander of a space shuttle. I am proud to have both flown in space and worked with him for so many years. Dex will be deeply missed by those of us at Johnson and the entire NASA family." In all, Poindexter logged 28 days in space. He is survived by his wife Lisa and their two grown sons. Poindexter earned an aerospace engineering degree from the Georgia Institute of Technology in Atlanta in 1986 and commissioned in the U.S. Navy after graduation. He became a naval aviator in 1988 and was deployed with Fighter Squadron 124 during Operations Desert Storm and Southern Watch. He became a test pilot in 1995 and joined NASA three years later. "Dex was a wonderful human being and a pleasure to have in the astronaut office," said astronaut Janet Kavandi, NASA's Director of Flight Crew Operations. "His good-natured demeanor made him approachable to his crews and the many people at Johnson and Kennedy who enabled his missions." NASA astronaut Alan Poindexter, STS-131 commander, is pictured near the windows in the Cupola of the International Space Station while space shuttle Discovery remains docked with the station. This image was taken on April 12, 2010. "He was a talented, courageous Navy veteran with gifts," wrote astronaut Greg H. Johnson, a shuttle pilot, in one post. "Dex was a lovable guy with a strong work ethic. He was selected to command a space shuttle on his 2nd flight: STS-131," Johnson wrote in another. Japanese astronaut NaokoYamazaki, who served as a mission specialist on Poindexter's STS-131 mission, said Poindexter was a hero to her. "Commander Poindexter will be in our prayers forever. So [honored] to be able to fly with him," Yamazaki wrote. "I learned a lot from the great hero." Japanese astronaut Soichi Noguchi was living on the space station in 2010 when Poindexter flew Discovery to the outpost to deliver vital supplies. "RIP, my friend Dex; we spent happy 11 days together on #ISS," Noguchi wrote on Twitter. He posted a photo of himself with Poindexter on the station in memoriam. Perhaps astronaut Clayton Anderson said it best: "America lost a great hero yesterday; I lost my commander, my colleague and my friend. RIP Captain Poindexter."